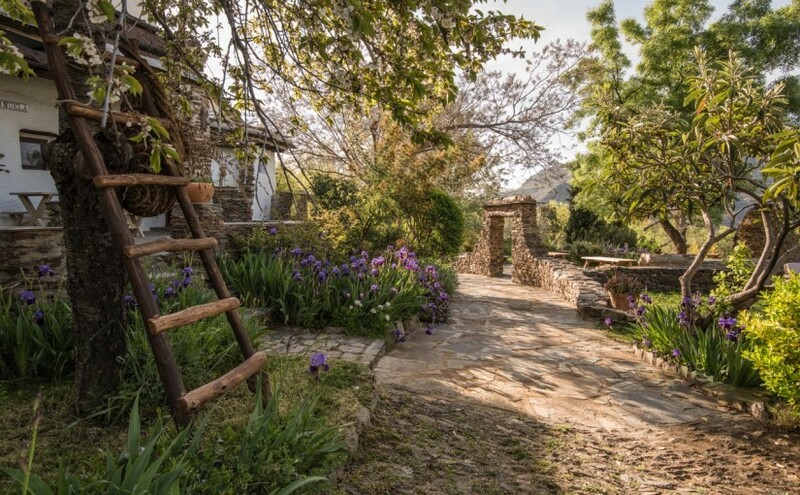 La Viñuela is a beautiful 300-year-old Spanish farmhouse (“Cortijo”) set in two acres of lush terraced grounds in the Alpujarras area of the Sierra Nevada mountains in Spain. It is situated about half-way between Granada city and the Costa Tropical. With unspoilt views across some of the loveliest countryside in Andalucía, the cortijo is an idyllic retreat for nature lovers, walkers, photographers, painters, or for those just seeking exceptional peace and tranquility. This is fabulous walking country, which can be enjoyed in any season. The whole area is protected and the high mountain is classified as a National Park. It is Spain’s largest and contains some 80 endemic plant species. The flowing water (one of the great surprises so far south), the enormous variety of scenery, the abundant flowers and wildlife, the pretty unspoilt villages, the wonderful climate, and the proximity to the coast and to Granada make this a very special place to holiday. Nestling into the mountainside at 1,150m, during the hot summers the garden’s many mature trees and irrigation channels create an oasis of shade and cooling water, and the chlorine-free salt swimming pool offers glorious but gentle refreshment. In the cooler months, high standards of heating and insulation and log fires provide all the cosiness and comfort you could wish for. The surroundings teem with flora, birds and other wildlife, and a vast network of footpaths provides outstanding walks at all levels, some of them based on mediaeval silk trails. The last muslim- controlled area of Spain, the Alpujarras produced raw silk for the workshops of Almeria and then Granada until the sixteenth century. With mainland Spain’s highest peak as a backdrop, La Viñuela is ideally situated for exploring the southern slopes of the Sierra Nevada or the lovely old Moorish villages of la Taha de Pitres. The coast and the fabulous historic city of Granada are an easy drive away – if you can tear yourself away from this home from home!